Today the 2015 Newbery Award is scheduled to be announced. 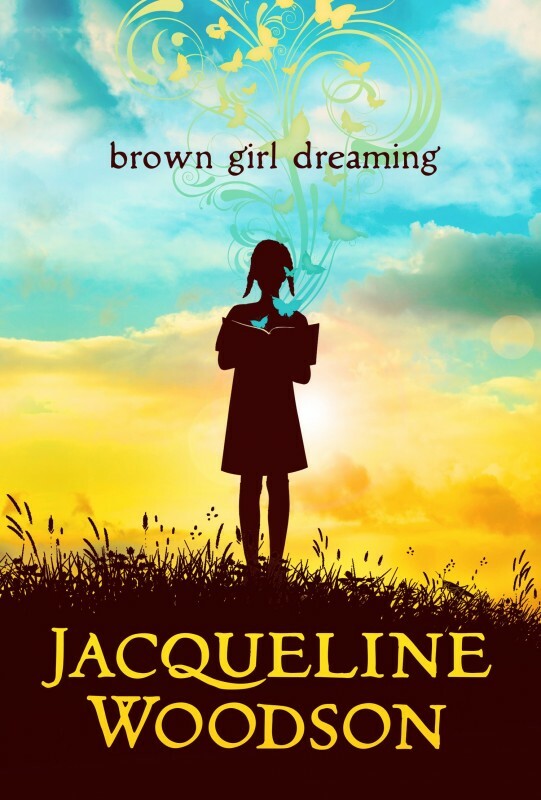 I’ve heard on good authority, from a fellow in tight with the School Library Journal, that brown girl dreaming is high on the list. In his opinion, it is the most deserving book of the year. I have not read all the entries, but I have read brown girl dreaming. I thought this would be an appropriate day to post my review. First, I have to mention that I’ve always been adverse to stories written in verse. I’ve never liked rhyming picture books, and I don’t care for the format in novels, either. Woodson writes in free verse, which is far better than rhyme, but still found the oddly spaced lines of text extremely distracting. The ideas she protrays, however, are quite remarkable. There is absolute, drop dead, gorgeous beauty in her imagery and in the creativity of her word choices. brown girl dreaming is an intimate look at Woodson’s own life. It starts with her birth, follows her youth through the tumultous years of the civil rights movement. It is a story of innocence, of wonder, of confusion–a struggle to form an identiy. Her years were split between the North and the South, shifting between accents, feeling home was in two places and never sure to which she belonged. Forced to the back of the bus in one place. One of many races in the other, with a best friend who speaks Spanish. Martin Luther King. Malcolm X. A brilliant sister one grade ahead. Struggles with a reading disability. Disappointed teachers who expected more Woodson brilliance. And always, stories. Stories in her head. Redeeming stories wherein she eventually does find her brilliance. It is an amazing journey, a vulnerable laying out of the girl who became the award-winning author, Jacqueline Amanda Woodson. It is an amalgamation of her experiences, of her person, a portrait of her. Yet her final pages felt pretty nebulous. She merges a multitude of contradictions designed to level everything and everybody. Some of them make absolutely no logical sense. A belief in everything is basically belief in nothing. I suppose I’m much too philisophical for such a feel good ending. Despite the ending, despite the verse, I give this book a high recommendation because the artistry within is so incredibly, breathtakingly beautiful. I am not crazy about books written in verse either. But this one looks good, and I love Jacquenline Woodson’s writing. It’s high on my list. I’ve got several other of her books on my list, as well. Sigh. Time! I need more time! I loved your review and am so glad you read it. It is worthy of a Newbery Award and the many other awards it has won. There were some really great books this year! Sorry, I knew it was an honorable mention. Should have put honors by it — to me that’s close enough. She did win the National Book Award for it. Haven’t read “The Crossover.” And, I have “El Deafo” on my shelf to read — I have to read it soon, but I’m not a graphics person. Hope she changes my mind because it’s a subject close to home. No, I’m referring to Shannon Messenger’s third book “Everblaze” in the “Keeper of the Lost Cities” series. Excellent. Can’t put it down! Getting pretty intense. Book four will be out next November. I understand. I am looking gforward to your upcoming releases. You will love Everblaze. I want to read it again. You are the second writer friend (and probably not the last) to recommend this book highly . It just bumped higher up my list. Thanks! Sorry I didn’t come up with one you could disregard, lol.